Ever been curious how many steps you take during the day? Well now you can find out many steps and how many calories you are burning throughout the day. The MIO Step 3 pedometer uses your personal data such as weight and stride length to provide you with a accurate results. Did you know that taking 10,000 steps in a day is approximately equal to buring 500 calories? Burning 500 calories a day, seven days a weeks equals 3500 calories which is equivalent to losing one pound of weight. The MIO Step 3 pedometer will assist you in reaching your weight loss or fitness goals while helping you maintain a healthy lifestyle. Step 3 is equipped with a pull pin panic alarm to ensure that you feel safe on your evening walk. 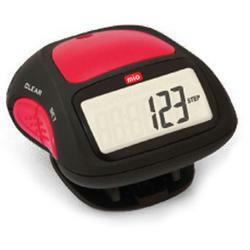 Just clip your MIO Step 3 pedometer onto your belt, pocket, bag etc and start walking! Clips on to belt, pocket, bags etc.